previous post: Japan returns to 1997 – idiocy rules! We had news this week that the annual rate of real GDP growth in Greece is finally positive after two quarters of positive growth. The austerity merchants are out in force congratulating themselves on a victory. Some victory. What the official data doesn’t publish are the long-term implications of the Depression that Greece has been locked in for the last six years. I look at that question in this blog (a little). Further, despite the claims by the European Commission and the lackies that it relies on to spread its distorted economic news that Greece has achieved a primary fiscal surplus, nothing is further from the truth. The fact is that the Greek fiscal deficit expanded considerably last year and despite all the austerity is still pumping public euros into the Greek economy and therefore supporting growth. The slight return to growth is not a victory for fiscal austerity but a demonstration that if large deficits are maintained for long enough growth will eventually rear its head. Eurostat published the preliminary estimates for the third quarter 2014 National Accounts data last week – GDP up by 0.2% in the euro area and up by 0.3% in the EU28 – which showed very weak growth overall in Europe and a further decline into recession for Italy. I will consider that data another day. The latest Greek National Accounts data published by the Hellenic Statistical Authority (El.Stat) came out on the same day and the El.Stat – Press Release – reported what might be considered to be good news. Available seasonally adjusted data1 indicate that in the 3rd quarter of 2014 the Gross Domestic Product (GDP) in volume terms2 increased by 0.7% in comparison with the 2nd Quarter of 2014. Available non-seasonally adjusted data indicate that in the 3rd quarter of 2014 the Gross Domestic Product (GDP) in volume terms increased by 1.7% in comparison with the 3rd Quarter of 2013. The following graph comes from the El.Stat – data – and shows annual (blue bars) and quarterly (red line) real GDP growth from the mid-1990s to the third-quarter 2014. Unfortunately we will have to wait for the detailed expenditure breakdowns before we can find out what is driving the growth. But the recent trends suggest that household and government consumption has risen a little in real terms but Gross Capital Formation has fallen. Net exports had also been rising and the state of the domestic economy is so dire that imports were well below exports. Butthat position reversed around this time last year and net exports were draining growth in the first and second quarters of 2014. Significantly, for those who want to see this as a victory for austerity you might want to think again. Eurostat Public Finance data 2013 – the Greek government deficit remained at 12.2 per cent of GDP in 2013 (an increase of 3.6 per cent of GDP). Out of that 12.2 per cent of GDP deficit, 3.6 per cent of it related to net interest payments by the government. So we might conclude that a primary balance of around 8.6 per cent was in place in 2013 as the growth turned positive. That is, there was substantial fiscal support still in place whether by design or not. Eurostat no longer published quarterly deficit figures for Greece so we cannot know for sure what the situation is right now other than a substantial fiscal deficit will be still pumping public money into the Greek economy. Further, there has been a lot of official tinkering with the data to give the impression that the Greek government was running a primary surplus in 2013. A primary fiscal balance is total spending minus total revenue net of all interest payments on government debt. The issue is that the European Commission has certain tricky ways of preparing the public finance data under its Excessive Deficit Procedure. The tricks were added to by the so-called special Economic Adjustment Program for Greece – the Troika bailout. The – Fiscal data – 2nd notification( Year 2014 ) (Provisional Data) – which is not prepared under the Excessive Deficit Procedure and the special Economic Adjustment Program for Greece shows a primary deficit of 8.2 per cent of GDP in 2013. So plenty of fudge factors, which led to reports like this from Reuters (April 23, 2014) – Greek primary surplus in 2013 was 0.8 pct/GDP-Commission. Greece had a primary surplus of 0.8 percent of GDP … a result that paves the way for some form of debt relief from euro zone governments that are now the main creditors of Athens. The timing of that statement was just before the May European Parliament elections and was designed to keep the reality of the Greek situation under wraps. The reality was that there was no primary surplus. Spending and revenue flows that would normally be included in the fiscal balance were shoehorned into other state accounts (for example, the pension funds) to take them out of the standard calculations. 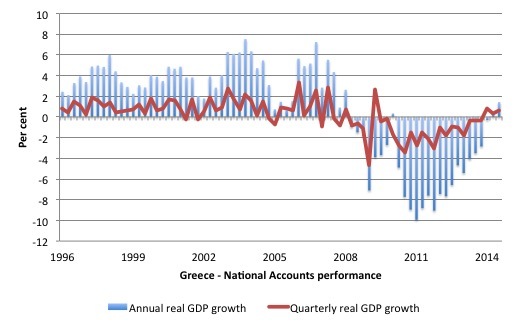 Even though the Greek government has been in surrender monkey mode to the Troika’s demands to cut public spending and this has caused massive damage (see below) to the Greek economy and Greek society, the fact is that there is still a substantial deficit remaining. That means that euros are being pumped into the economy from the Greek public sector every day. At some point, once the economy has bottomed, the automatic stabilisers built into the fiscal policy parameters will start to support the base level of economic activity. The growth is weak and is being supported by that on-going daily fiscal deficit. Given the state of the economy, the deficit is many times too small. But deficits by definition mean that the government is providing net financial assets to the non-government sector which help growth – much to the chagrin of the bullies in Brussels, Frankfurt and Washington. But I wouldn’t want to leave you with the impression that I think things are heading in the right direction. 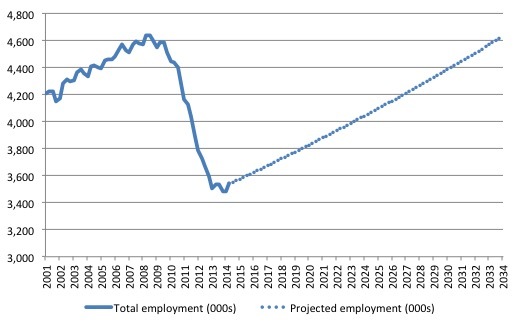 Consider the following graph which shows total employment in Greece in thousands from the March-quarter 2001 to the June-quarter 2014 (blue solid line). This is the data drawn from the quarterly labour force survey conducted by the Hellenic Statistical Authority (El.Stat) – Labour Force data. The peak employment level was 4639.6 thousand achieved in the September-quarter 2008. 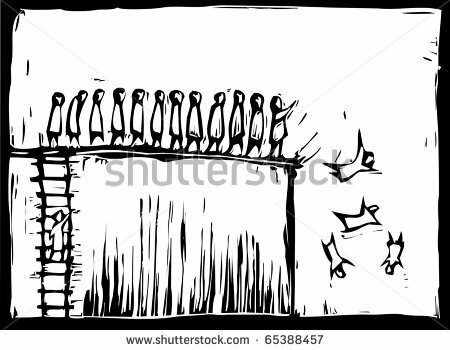 Then the sudden drop occurred as the Troika closed in on the Greek government and the politicians became surrender monkeys when the pressure was put on them. Between the peak quarter (September 2008) and the trough quarter (December 2013), Greece lost 1,159.7 thousand jobs or 25 per cent of their total employment base. Unemployment rose by 973.2 thousand (27.8 per cent) from 364 thousand (7.3 per cent). That is just one measure of the hideous damage that the austerity imposed on the population. They could have avoided most of that had they left the Eurozone or never joined in the first place. The blue dotted line is the product of the following mental exercise. Suppose that total employment in Greece grows steadily from this point forward (latest data is for June-quarter 2014) at the average quarterly rate of growth that was achieved between the March-quarter 2001 and the peak September-quarter 2008. That average was 0.3 per cent per quarter. The blue dotted line then simulated total employment growing steadily at that rate – note it is the same slope as the earlier growth period without the little real-world wobbles. The end of the extrapolation is the June-quarter 2034. Why did I choose that end-point? Simple: it is the point where total employment would once again equal the September-quarter 2008 peak. It means that even under favourable growth conditions (which were evident before the crisis), it will take Greece another 20 years from now to regain the employment lost by the imposed policy austerity. And by then the population will have continued to grow modestly. The average labour force growth over the 2001-2008 period was 0.2 per cent. So employment growth before the crisis was slightly faster than the underlying population growth which allowed the unemployment rate to fall slightly. Assuming the labour force growth matched its previous average, then by 2034, when employment finally catches up with where it was in the September-quarter 2008, unemployment will still be 956.6 thousand or 17.1 per cent of the labour force. These numbers are not wild guesses and they are on the optimistic end of the scale. It could be that the situation in Greece remains so dire that labour force growth doesn’t occur (it is currently negative) as people leave the nation looking for opportunities elsewhere. But what these numbers tell you is that in the scales of ‘recovery’ that organisations such as the IMF or the European Commission predict will occur over the next several years, there will be very little beneficial effects delivered to the population. Given employment growth is unlikely to be as high as it was pre-crisis, the situation will remain worse than this simulation might suggest. Unemployment will remain very high for decades. Is being able to have a euro in your pocket worth that sort of sustained income loss? I cannot construct any situation where you could possible answer yes to that question. 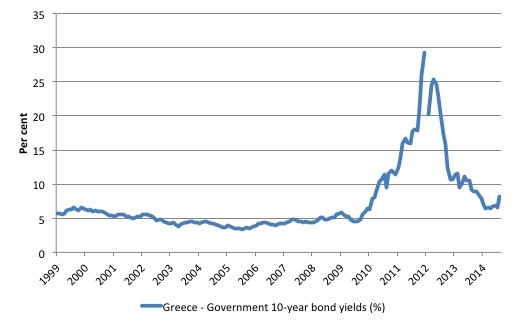 The Bank of Greece published data on – Government Bond Yields. Here is there complete history of Greek government 10-year bond yields (from March 1999 to October 2014). The graph shows monthly averages. 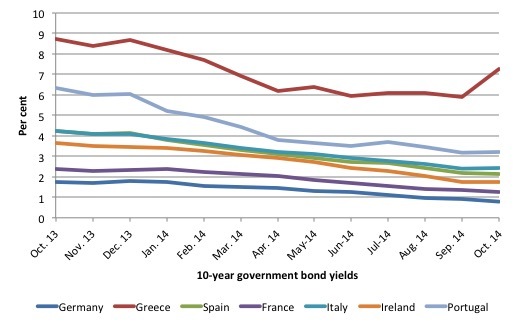 Daily data provided by the ECB – provides a comparison of Greece’s 10-year bond yields with those of Germany, France and the other PIIGS over the last year. Things have really changed in the last month and particularly the last week. Yesterday, the 10-year bond yield for Greece jumped sharply to 8.369 per cent from 8.1 per cent. The UK Guardian – reported – that the yields have risen because there is now renewed uncertainty about the relationship between the Troika and the Greek government, with respect to the capacity of the latter to implement the rest of the austerity plan. Apparently, the Troika bullies (so-called auditors) are threatening to abandon the process underpinning “the final quarterly review”, which would have given the Government more credit. They claim that the actual fiscal position of the Greek government is “almost three times the €1bn the government estimates” and there hasn’t been enough deregulation, pension cuts and sacking of public servants. The Troika want the government to cut a further €2.5 billion from net public spending, which would almost certainly kill of the modicum of growth that is currently visible. This is at the same time as the ECB has said they will not undertake any “debt-restructuring” of Greek bonds. The PEW – Global Attitudes Survey – Spring 2014 – however, reveals that Europeans have still not grasped the basis of their problems. This graph taken from the Report (page 18) suggest that “declining public trust in the European project and EU institutions has bottomed out and now seems to be rebounding in a number of countries”. Okay, and what about this graph, which shows that “the commitment of most Europeans to their single currency remains strong”. Sentiment for keeping the euro and not returning to their previous national currency has actually strengthened over the past year in Germany (72%, up from 66%) and remains virtually unchanged in Greece (69%), Spain (68%) and France (64%). Only in Italy has there been a serious erosion in the euro’s appeal, with the desire to keep the single currency falling from 64% to 45%. 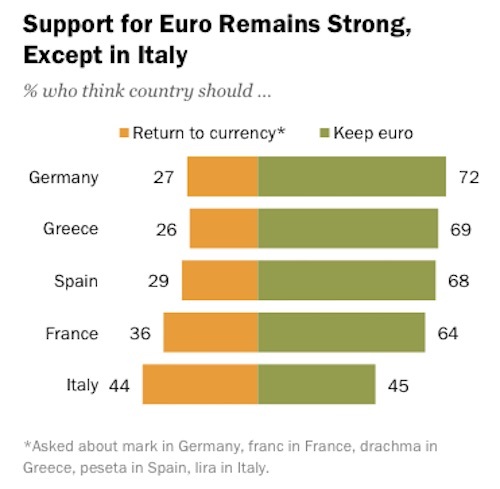 Italians are now divided on whether to stay in the euro area or to exit it and return to using the lira. This is the first time euro support has fallen below 50% in any of the five euro area countries surveyed since 2010. So perhaps my hope that it will be Italy that demonstrates the leadership necessary to end this madness (by exiting) still has some prospect. But it looks pretty grim. The problem of stagnation and high unemployment in Europe is not structural. It is due to a lack of spending overall. The private sector is clearly spending what they consider to be sustainable at this point in time. That is not sufficient – obviously – to generate growth commensurate with low unemployment. The solution is more public spending and/or lower tax rates – that is, higher deficits. I was at a dinner the other night and was asked how higher should deficits in Europe be and my rough rule of thumb is in places like Greece about 2.5 to 3 times higher. Elsewhere a little less than that. The euro is the problem and the ridiculous fiscal rules parading as the Stability and Growth Pact just make it worse. The SGP provides no stability nor growth. What a farce! I am off to Italy for a few days from tomorrow to speak at the – How Can We Govern Europe – Roundtable. I expect to be in a small minority of speakers (perhaps the only one) advocating the dismantling of the Eurozone and a return to national currencies. The Greek experience tells me that it is the only way for nations to achieve sustained material prosperity. The structure of the Eurozone is biased to stagnation and entrenched high unemployment rates. As a result of travels, my blog may be a bit patchy in frequency while I am away. My English publisher – Edward Elgar – will publish my book – Eurozone Dystopia: Groupthink and Denial on a Grand Scale – in May 2015. Eurozone Dystopia traces the origin of the Eurozone and shows how the historical Franco-German rivalry combined with the growing dominance of neo-liberal economic thinking to create a monetary system that was deeply flawed and destined to fail. William Mitchell argues that the political class in Europe is trapped in a destructive groupthink. Based on a flawed understanding of macroeconomic fundamentals, groupthink extols the virtues of the erroneous concept of the self-regulating free market and prevents Europe from seeing its own policy failures. As a result millions are unemployed, with imperiled member states caught in a cycle of persistent stagnation and rising social instability. I am meeting the Italian publisher in Rome next Monday to discuss the situation with the foreign language versions. Please remind the Italians that Germany received debt forgiveness in 1953 and ignored SGP rules as France continues to do today! The fact that more than 2/3 of Greeks and Spaniards still support the euro is nothing short of incredible. I suppose that the majority of people in those countries have bought the story that their economic tribulations are due to private and/or public profligacy and structural deficiencies. They may believe that if they were more like the Germans, they wouldn’t have the problems that are now afflicting them. Unlike the north – the movement from the agrarian village to the satanic mill remains in living memory. The promise of material wellbeing in exchange for a sacrifice in redundancy worked out for a few decades in the 20th century, now they have neither. I find Bills nation state / central banking nirvana hard to grasp when looking at real Spanish or Irish history. The movement of people in search of scarce currency was just as intense during the so called nation state era. None of yee academics seem to have walked around these countries, looking at recently abandoned villages in Aragon puts a different visage to events ,cross over to the French ariege and you see the French banking state doing the same thing but 50 years previously . What we are now seeing in Europe is a mere scaling up of the bank scarcity engine to continental size. Now we are seeing the entire state of Spain losing its domestic population. Same as it ever was , same as it ever was. Yes, all is wonderful in Greece (/sarcasm). The unemployment rate has dropped to a measly 25% (sorry sarcasm again), and GDP eeked out a 0.2% gain despite still being 30% lower than where Greece was before the great recession. At a 0.7% quarterly growth rate they will return to their pre-recession GDP peak in about 40 years. According to the trading economics data website net migration into Spain remained high into Y2010 at +225,000 even as the population numbers began to roll over into decline chiefly as a result of crashing fertility post Y2008. These are very strange demographic figures to say the least and in my opinion are chiefly as a result of the loss of purchasing power of lo cal 20 and 30 somethings. The international migrant stock was just 2.1% in 1990 and 13.8% in 2010 – a huge increase and the chief reason for the population increase during that time . ulation of migrant stock and perhaps a majority of its under 40 population non native. My question is how is this much different from the French nations 19th century policy of destruction of the regions? american Borg programme of assimaltion has become a wild success. People no longer have any local or albeit artificial national glue. They can become ever more easily monitized. I judge that a success from a bankers point of view. So what is exactly happening ? This is obviously false capitalistic growth as these people are not like Norsemen looking for green fields and slaves. This movement of people are indeed the slaves themselves. They are in search of tokens rather then land as the UK has even less physical wealth then Spain per capita. The movement of worldwide populations is pushing local people out of Iberia and landing them into the worlds financial center simply because that is where the tokens reside. This is a classic case of false capitalistic growth where energy use per person is crashing. Judging by the movement of monetary slaves within euro land we can now say with certainty that the eurozone is a British colony . How can one deny the physical reality on the ground ? The majority of the poor are the working poor and poor pensioners in the UK, just as they are in impoverished Europe. 97 per cent of the benefits bill in UK are the working poor and poor pensioners. The working poor are on wages stagnated a decade into the past. Who says England is not already Greece. So the UK is mimicking Greece, yet we have no European debt. The No2EU party in England said the truth about Europe, but could make no headway in European Elections as ignored by blogs and media alike. Greece before going into the Euro was doing just fine with the Drachma and people could live. The day the Euro arrived, worth about 300 Drachma for 1 Euro, prices went into a 1000 per cent inflation rate. A bottle of water for 50 lepta went up to 50 cents. Now nobody can reallya afford food. In Greece, there is no basic tax allowance and taxes pile on taxes on wages forced to be lowered by the Troika. The welfare state has gone. So has social medicine needing charitable donations from such as Austria for even bandages and aspirin for Greece’s public hospitals. Despite paying IKA stamps for decades, once unemployed there is no access to medicine or treatment. The young are emigrating in the same tidal wave as left in the 1950s after the world war and civil war left the country in the same state it is today. IMF’s Lagarde’s faux pas said the truth that Greece is as well off today, as it was in 1944 (occupied by the Gestapo with hyper-inflation meaning 1 million Drachma note for a loaf of bread). The old in Greece are having their pensions reduced more and more, from all sources, as the money is being taken, as throughout Europe, by the EU government to pay off debt created by them on the bulk of EU member states. Today the government says an income of 300 Euros a month is not poverty, when 700 Euros a month was the basic wage now lost. In Athens it is very rare to see a pregnant woman. Most pregnant women and with small kids have gone home to the country towns to live off the land. Yet now that the cashless have been given land grants to grow food, the Troika from this year taxes gardens, small food plots, the garden shed and land gone back to wild forest, and a decrepit old village house inherited from great grandparents, that may or may not have electricity. The EU shows that 80 per cent of austerity has yet to hit the UK, when already starvation has risen in the UK over 70 per cent since 2010, as has benefit sanctions which can deprive someone of access to food vouchers to food banks, themselves cruel as only 3 vouchers in a year. In Europe, charities / councils provide daily free cafes offering a cooked meal and hot drink, 7 days a week. On top of which are all the losers of any state pension, after women losing 6 years of payout and men 1 year, when benefits are taxes and then being lost altogether. The state pension is not more but less with all the ending of such as the State Earnings Related Pension Scheme that in 2002 became the State Second Pension and Pension Credit (savings) and the increase from 30 to 35 years needed NI contributions. Just when MPs get at 11 per cent pay rise in 2015, that is about the same money as the lowest state pension of all rich nations save poor Mexico, when the poor in England are deprived state pension payout, which is payable if can remain in work or are early retired in lieu of redundancy from the massive austerity cuts that will reach 1 million by 2018.